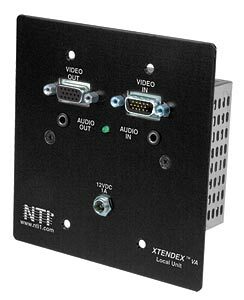 The XTENDEX ST-C5VA-WL500 Wall Mount VGA Extender transmits VGA video and stereo audio up to 500 feet away from a computer using CAT5 cable. Each video extender consists of a local unit that connects to a computer and also supplies video and audio to a local monitor and speakers, and a remote unit that connects to a monitor and speakers. The local unit fits into a two-gang wall box, while the remote unit can be placed on a tabletop or mounted to a wall. Supports local and remote VGA monitors and stereo audio speakers. Mountable in walls, shelves, under a table or podium. Saves power by switching to "sleep" mode when no video signal is available. LED power indicator on front panel. Supports a PC, SUN, MAC with VGA video. Crip and clear 1920x1440 video resolution. Crisp and clear 1024x768 resolution at 500 feet; higher resolution supported at shorter distances. Flexible mounting; mounting tabs included. Local unit: 110 or 220 VAC at 50 or 60 Hz via AC adapter. Remote unit: powered from the local unit.